The forested country of Nirmathas is known for its rangers—skilled trackers, marksmen, and silent stalkers under the leafy canopy. Nirmathas has no formal military, for her people love their freedom and are reluctant to take orders from anyone, so her defense falls to individual scouts and small groups of allied commandos. Many of Nirmathas’s rangers take the guide or skirmisher archetypes, but some focus on the magic of stealth. These irregular troops fight against the frequent invasions by Molthuni soldiers, striking quickly and melting into the green shadows as soon as their opponents rally themselves for a counterattack. A Nirmathi irregular has the following class features. A Nirmathi irregular is proficient with all simple and martial weapons and with light armor. This replaces the normal ranger armor and weapon proficiency. At 1st level, a Nirmathi irregular selects one favored enemy (usually “humanoid [human]”). He does not gain additional favored enemies at higher levels. He does get to increase his favored enemy bonus by +2 at 5th, 10th, 15th, and 20th level. This otherwise acts as and replaces the standard favored enemy ability. 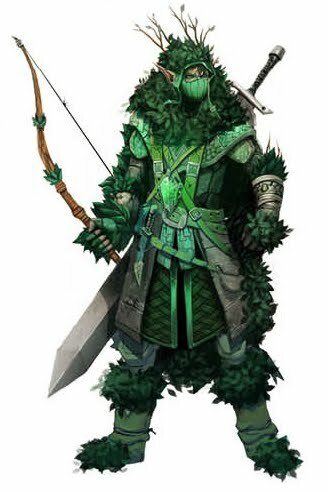 At 1st level, a Nirmathi irregular adds a bonus equal to 1/2 his level on all Perception and Survival skill checks he makes while located in forest terrain. At 3rd level, a Nirmathi irregular selects one favored terrain (usually “forest”). He does not gain additional favored terrains at higher levels. He does get to increase his favored terrain bonus by +2 at 8th, 13th, and 18th level. This otherwise acts as and replaces the standard favored enemy* ability. At 4th level, a Nirmathi irregular increases his number of spells per day by +1 for every spell level. This means the irregular gets at least 1 spell per day as soon as he gains access to a level of spells, even if Table: Ranger lists 0 for spells per day. A Nirmathi irregular also learns to draw upon druidic magic, perhaps from association with the druids of Crystalhurst or a natural connection to the magic of the Fangwood. Each day when the ranger prepares spells, he may choose one druid spell and prepare it as if it were on the ranger spell list as a ranger spell of its druid spell level. Both focused enemy and focused terrain are listed as acting as and replacing the favored enemy ability. This is likely in error, and GMs are encouraged to treat focused terrain as a replacement for favored terrain.